A report on the British Society for Immunology Annual Congress, Harrogate, UK, 5-8 December 2000. This large annual immunology meeting covered a wide range of subjects from biochemical protein characterizations to cell biology and the study of complex disease pathologies. One particularly interesting session covered the emerging field of non-classical major histocompatibility complex (MHC) class I molecules. A great deal of attention is now focused on defining the expression, structure and ligands of these proteins, as recent research has indicated that they are involved in both innate and adaptive immunological responses. Heat shock proteins are another group of molecules that appear to have a wide range of immunostimulatory and regulatory effects; a one-day session covered recent advances in our understanding of the immunological roles of heat shock proteins as well as their potential therapeutic uses. Moving on from individual protein families, speakers in the plenary session discussed the complex dynamics of lymphocyte activation, cell-cell interactions and protein translocation. MHC molecules are expressed on most cell types and are responsible for presenting antigens to cells of the immune system. MHC class I molecules present mainly peptides derived from intracellular proteins, while class II molecules present peptides derived from extracellular proteins that have been internalized into the cell. Peptide presentation by MHC class I proteins is one of the best studied aspects of molecular immunology. The human MHC encodes several additional class-I-like proteins including HLA-E, HLA-F and HLA-G. These so-called 'non-classical class I molecules' are similar in sequence and structure to MHC class I molecules but do not show the striking polymorphism seen for their classical relatives and may be encoded outside the MHC. They have only recently come into their own, partly due to their emerging role in natural cytotoxicity, which is mediated by natural killer (NK) cells. Paul Travers (Anthony Nolan Research Institute, London, UK) explained how non-classical class I molecules differ functionally from their classical cousins in their alternative binding properties and expression patterns. They can fulfil a variety of roles and tend to show specialized antigen-presentation features. For example, members of the non-classical CD1 family present lipids and bacterial cell wall components rather than peptides for T-cell recognition and, by doing so, play an important role in the response to mycobacterial infection. D. Branch Moody (Harvard University, Massachusetts, USA) described studies showing that chain length affected the binding of lipids to CD1 and consequent T-cell stimulation. Dendritic cells preferentially presented long-chain lipids, in a process that appears to require endocytosis before loading onto CD1. Moody also raised the issue of the potential role of non-classical class I molecules in autoimmunity, and presented data to suggest that reactivity to self CD1 molecules might provide potent T-cell stimulation in autoimmune thyroiditis. NK cells play an important role in the innate response to pathogens and tumors. Their cytotoxic functions are controlled by an interplay between activatory and inhibitory receptors that recognize MHC class I molecules on potential targets. These receptors include the killer cell immunoglobulin-like receptors (KIR), which can recognize classical HLA-A, B and C alleles. In contrast, the lectin-like CD94:NKG2 receptors recognize HLA-E, an MHC-encoded, non-classical class I protein. HLA-F and HLA-G are further examples of non-classical class I proteins encoded within the MHC. HLA-G is expressed at high levels on the maternal/fetal interface, yet its role remains unclear. Even less is known about HLA-F. Eric Lepin (Oxford University, UK) detailed some of the first characterizations of this protein, which he refolded in vitro in order to generate an HLA-F-specific monoclonal antibody. Using this, he showed that HLA-F appeared to be predominantly intracellular and was seen in T and B cell lines in addition to thymus, tonsil and spleen sections. The ligand (if any) presented by HLA-F remains unknown. Lepin's studies using recombinant HLA-F demonstrated that, like other class I proteins, HLA-F can be recognized by the immunoglobulin-like transcripts ILT2 and ILT4, which belong to a family of highly homologous inhibitory or activating receptors expressed on a broad spectrum of leukocytes from T cells to macrophages and which are thought to play a role in the regulation of immune responses. In the future, such studies may reveal further HLA-F-specific receptors. ILT2 is an inhibitory receptor that can engage a variety of non-classical and classical MHC class I proteins with varying affinity. One of its high-affinity ligands is the viral MHC class I homolog UL18, encoded by human cytomegalovirus (HCMV) and expressed on HCMV-infected cells. HCMV can downregulate the expression of classical MHC class I proteins on the surface of the host cell, which leaves the infected cell susceptible to lysis by NK cells. When the viral protein UL18 was first found to resemble an MHC class I molecule, it was believed that it might act as a decoy for regulatory NK cell receptors such as KIR in order to prevent lysis of the infected target cell by NK cells. But when UL18 was found to bind only the ILT2 receptor, it seemed possible that recognition of UL18 by ILT2 on the surface of macrophages might downregulate functions such as cytokine production (Figure 1). Neil Young (Oxford University, UK) described an additional mechanism, where recognition of UL18 by ILT2 on T cells could alter their cytotoxic function (Figure 1). Young found high levels of T cells expressing ILT2 in the blood of HCMV-infected people. Fluorescent MHC complexes bearing a viral epitope were used to purify HCMV-specific T cells from infected individuals. Following selection, about half of the viral-specific T cells expressed the ILT2 receptor at their surface. ILT2 expression was shown to have a direct effect on T-cell activity, as recognition of UL18 by ILT2 on viral-specific T cells prevented lysis of UL18 expressing infected targets. These results provide a valuable insight into the role of recently characterized immune receptors and their ligands in immunoregulation. Viral subversion mechanisms underline the physiological importance of these systems in our response to infection. Immunomodulation by the viral MHC class I homolog UL18. 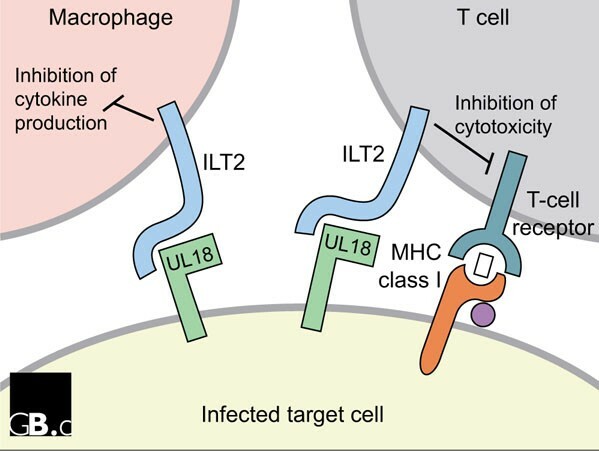 Human cytomegalovirus encodes the MHC class I homolog UL18, which is expressed on the surface of infected cells. Interaction of UL18 with ILT2 on the surface of macrophages might result in a downregulation of cytokine production. New data suggest a further role for UL18 when it binds to ILT2 on the surface of 'killer' T cells, as this interaction inhibits the antigen-specific cytotoxicity of the T cells. Heat shock proteins (Hsps) are highly conserved and abundant molecular chaperones, which can also act as potent immune stimulators. Several exciting new findings were presented in a one-day session concerning the immunological importance of Hsps. Pramrod Srivastava (University of Connecticut School of Medicine, Farmington, USA) described how the immunological significance of Hsps has unfolded over the last 40 years. Early studies indicated that mice immunized with tumors subsequently became immune to further challenge with the same tumor. Amongst the proteins responsible for such protection were members of the Hsp family, including Hsp60, Hsp70, gp96 and calreticulin. Srivastava reported that clinical trials with cancer patients are now taking place to determine whether immunization with Hsps isolated from their own tumors can be used as an effective treatment. These trials appear to show promising results for several diseases, including renal cancer, lung cancer and melanoma. Srivastava also discussed several features of Hsps that may contribute to their immunogenicity. In accordance with their role as chaperones for protein folding, Hsps have an innate capacity to bind peptides. By holding a wide selection of peptides, Hsps can carry a peptide 'fingerprint' of the cell they come from, and therefore provide multiple epitopes for MHC presentation and subsequent T-cell stimulation. As well as providing peptides, Hsps themselves can stimulate macrophages and dendritic cells to secrete cytokines, and can also trigger the migration of dendritic cells. Immunization of mice with nanogram quantities of gp96 leads to a massive infiltration of dendritic cells into draining lymph nodes. Srivastava emphasized that there are cell-surface receptors for Hsps, despite them normally being intracellular. He suggested that recognition of extracellular Hsps might act as a potent 'danger signal', indicating that necrotic cell death had taken place. Tom Lehner (Kings College, London, UK) identified the low-density lipoprotein receptor-related protein CD91 as the cell-surface receptor responsible for recognition of gp96. Hsp60 is already known to bind CD14, a glycosylphosphatidylinositol (GPI)-linked glycoprotein, which also acts as a receptor for bacterial lipopolysaccharides, and Hsp70 can ligate CD40, a member of the tumor necrosis factor (TNF) receptor family. Lehner also described the potential use of Hsps as immunostimulatory adjuvants for vaccination. Continuing this theme, Rolf Kiessling (Karolinska Institute, Stockholm, Sweden) presented murine immunization studies in which Hsp70 treatment induced the production of cytokines including TNFa, Interleukin (IL)-1 and GM-CSF, and Steven Nadler (Bristol-Myers Squibb Pharmaceutical Research Institute, New Jersey, USA) reported that fusion constructs of the 10 kDa carboxy-terminal portion of Hsp70 could be used specifically to target proteins such as NF?B to the nucleus. Hans Schild (University of Tübingen, Germany) described how dendritic cells specifically bound and then endocytosed fluorescent gp96. Confocal microscopy showed that following receptor-mediated endocytosis, gp96 colocalizes with MHC class I and class II proteins (probably for the purpose of peptide loading) but does not actually enter lysosomes. Dendritic cells that had been activated by gp96 were also found to release IL-12 and to stimulate cytotoxic T cell expansion. Hsps are highly conserved across all species from bacteria to human. Willem van Eden (Utrecht University, The Netherlands) discussed how cross-recognition of bacterial and self-Hsp epitopes might provide a positive effect in autoimmunity. Microbial Hsps are known to be protective in animal models of arthritis. Van Eden showed that, in the Lewis rat strain, mycobacterial Hsp70-specific T cells could cross-react with self epitopes. An intranasal dose of mycobacterial Hsp70 was sufficient to protect animals from arthritis, particularly if applied together with a trypsin inhibitor in order to prevent protein breakdown. Van Eden also addressed the possibility that self-Hsp epitopes could be recognized as 'altered peptide ligands' by bacterium-specific T cells, leading to incomplete activation of T cells and their subsequent development into a regulatory phenotype expressing the anti-inflammatory cytokine IL-10. He proposed that, following upregulation of self Hsps during an inflammatory response, Hsp-specific T cells might subsequently downregulate the response. The plenary session drew together several interesting aspects of lymphocyte activation and signaling. Antonio Lanzavecchia (Institute for Research in Biomedicine, Bellinzona, Switzerland) presented some of his extensive research into the field of T-cell triggering and costimulation. Using data from an adoptive transfer system, Lanzavecchia introduced the theory that T-cell activation can result in intermediate 'non-polarized' T cells as well as the well characterized final differentiation stage of effector cells. Non-polarized cells show little cytokine production but express the chemokine receptor CCR7, which allows them to enter lymph nodes. Fully differentiated effector cells lack CCR7 and migrate instead to inflammatory sites. According to Lanzavecchia, dendritic cells can be regarded as the 'packets of information' that provide all the necessary stimuli to prime T cells. Lanzavecchia described an in vitro model used in his laboratory to study dendritic cell maturation. When young (8 hours) and old (48 hours) dendritic cells are compared, they produced a different repertoire of cytokines, which in turn influenced the type of T-cell response that they triggered. The functional importance of membrane rafts featured heavily in this session. These cell membrane microdomains are now accepted to play an important role in lymphocyte signaling. Rafts are rich in cholesterol, sphingomyelin and cytoplasmic signaling molecules. Their extracellular components include proteins anchored by GPI and lipid-modified transmembrane proteins. Vaclav Horejsi (Academy of Sciences of the Czech Republic) showed that, following detergent lysis, membrane rafts can be purified for analysis by gradient density centrifugation, although their size, heterogeneity and dynamics in vivo remain somewhat controversial. Susan Pierce (National Institute of Allergy and Infectious Diseases, Bethesda, USA) summarized published work from her laboratory on how rafts act as platforms for the B-cell receptor to associate with the Lyn kinase and undergo endocytosis to the compartment where the MHC class II molecules are loaded with peptides. B-cell receptor crosslinking led to its translocation into rafts where the Lyn kinase is constitutively present, so that receptor phosphorylation can take place. Following entry into rafts, the B-cell receptor is then endocytosed into the cell. Pierce described that only certain raft components were co-internalized with the B-cell receptor, indicating that some degree of sorting must take place. She also described an interesting example of viral evasion whereby, during Epstein-Barr virus infection, the viral LMP2A protein blocks B-cell receptor signaling by preventing the receptor's entry into rafts. In one of the most visually impressive talks of the conference, Mike Dustin (Washington University School of Medicine, Missouri, USA) illustrated the molecular dynamics of the T-cell receptor synapse, the site where the antigen-presenting cell makes direct contact with the T cell. An advanced technology allowed control of the density and mobility of multiple proteins in a system that is optically ideal for fluorescence microscopy. He showed that, shortly after contact between a T cell and its target, a 'bulls-eye' pattern forms, consisting of a central ring of integrins surrounded by a circle of MHC proteins. Over several minutes, this structure inverts to give a central group of activated T-cell receptors surrounded by a ring of adhesion receptors. The leukocyte common antigen CD45, an abundant phosphatase found on almost all cells of hematopoietic origin, is essential for T-cell activation and its location within the immunological synapse has been controversial. Using three-dimensional analysis, Dustin showed that, following its initial exclusion, CD45 relocates to the centre of the synapse in a cup-like structure that may be maintained by endosomes within the cell. The principal immunological challenge for organisms is to detect an invading pathogen and mount a rapid defensive response. The meeting showed once more that we have gone a long way towards understanding the molecular steps and cell-cell interactions involved in providing such host defense. But as novel molecules are identified and more sophisticated techniques evolve to look at how cells communicate with each other, the complexity of the immune system becomes even more apparent.